No joke. In 10 days one of my dreams is about to come true and the best part is that it’s going to benefit cancer patients. The dream? It’s running a race with my husband. I know, I know. It sounds eye-rollingly mushy, but don’t tell anyone: I’m a closeted sap. I have always been enamored by the idea of running. It’s the purest form of exercise, just you and your legs pounding the pavement. No weights, mats, ropes, pulleys, bars, BOSUs. Nada. 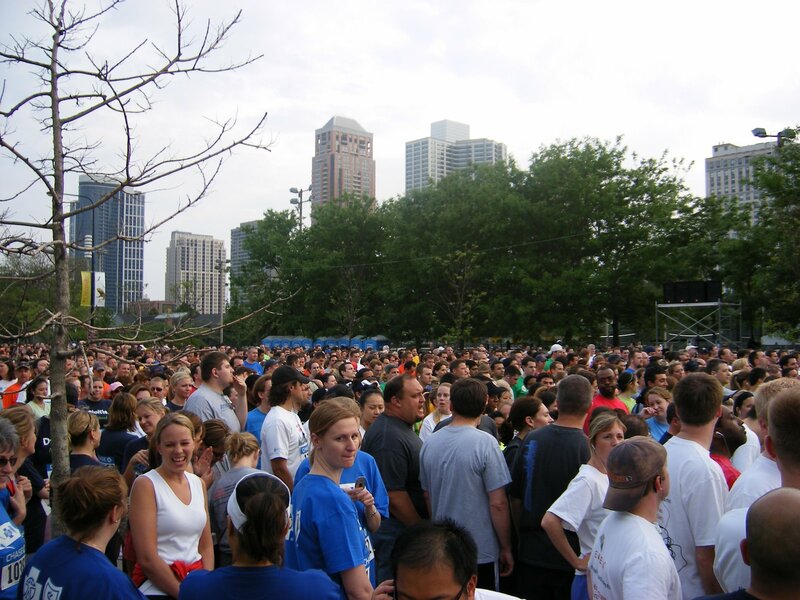 I started running in 2002, largely because many of my co-workers were doing the Corporate Challenge, a 5K. I didn’t want to be the one bringing up the rear, so I put mine in gear and started training. It sucked in the beginning, but I stuck with it and fell in love. I love the runner’s high. I love how running gives me time to think. I love what it does for my body. (Finally I found something that could turn my pear shape into an hour glass.) So let’s fast forward several races, including the 2006 marathon. In that race, I asked Hubby to jump in after mile 20 to help me get to the finish line. He ran with me until about mile No. 25 and hearing his footsteps next to mine, pushing me to keep going meant so much. He’s not an avid runner, but he stuck it out with me and I wanted that experience again. Also, in most Chicago races there’s a beautiful view that always gives me chills. You’re on Grand Avenue and about a half block away is Michigan Avenue. Looking up, you see upper Michigan Avenue, it’s almost like a bridge. And you can read the sign for Nordstrom. 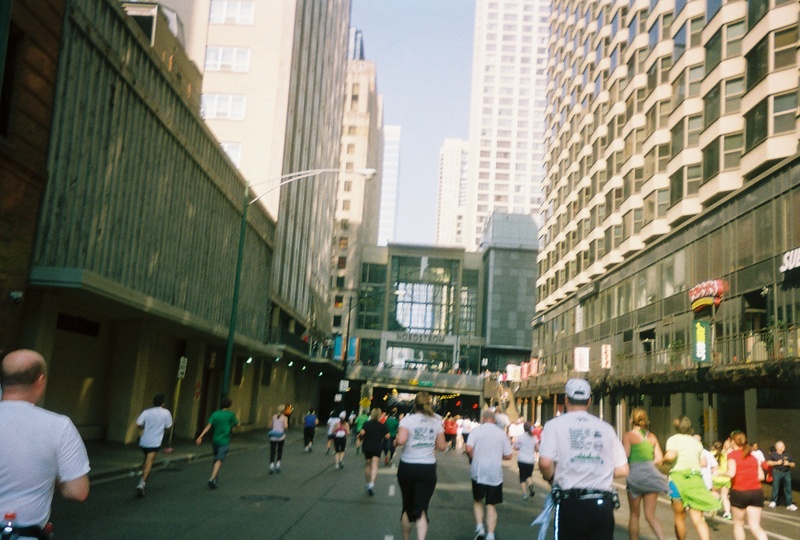 The street slopes down so below you is a sea of bobbling heads, runners whooping it up because their voices reverberate off the walls of lower Michigan Avenue, the Magnificent Mile’s underbelly. The energy is electric and at that moment I always feel like I can do anything. I want to share that moment with my best friend, my Hubby. He’s always known this. And I’ve tried not to pressure him into running a race with me, just gently asking if he’d like to join me some day and finally, this year, he’s strapping on his shoes and running his first race. I’m soooo stoked. 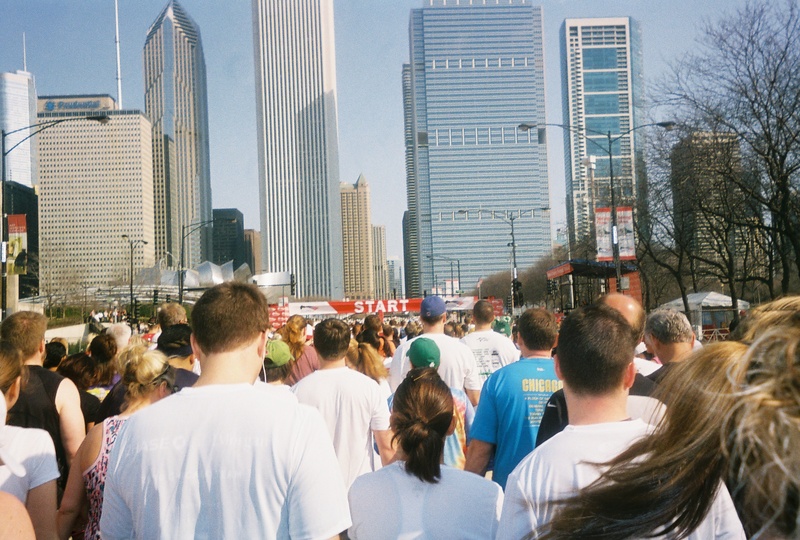 We’re doing the Shamrock Shuffle on April 10. 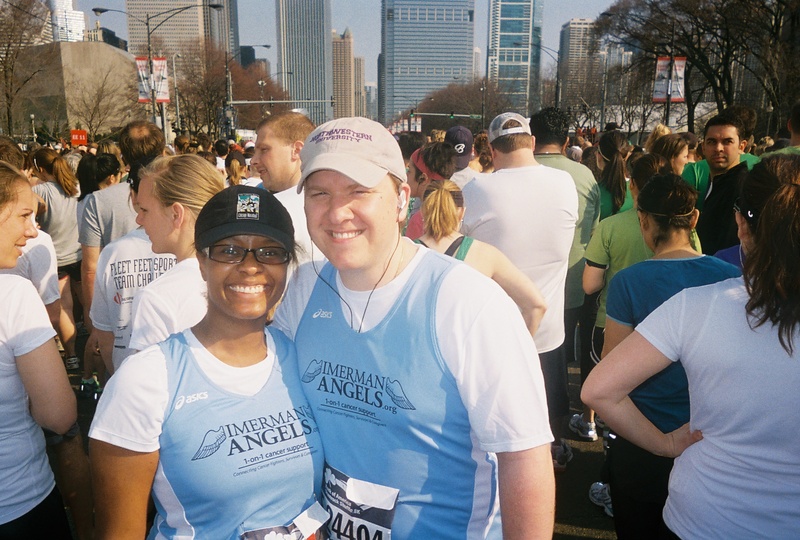 This year we’re running as part of a charity team, the Imerman Angels. It’s a neat group because they focus on pairing cancer patients with people who have successfully fought the same type of cancer and it connects parents, spouses, kids of cancer patients with other caregivers and survivors. It’s a one-on-one service and it’s free. Which is why we’re raising money for them. Unfortunately, our enthusiasm for the race and this group hasn’t matched with what we’ve raised. We’re still quite short of our fundraising goals, so even if you’ve got an extra $5 to share, click here and make a donation. 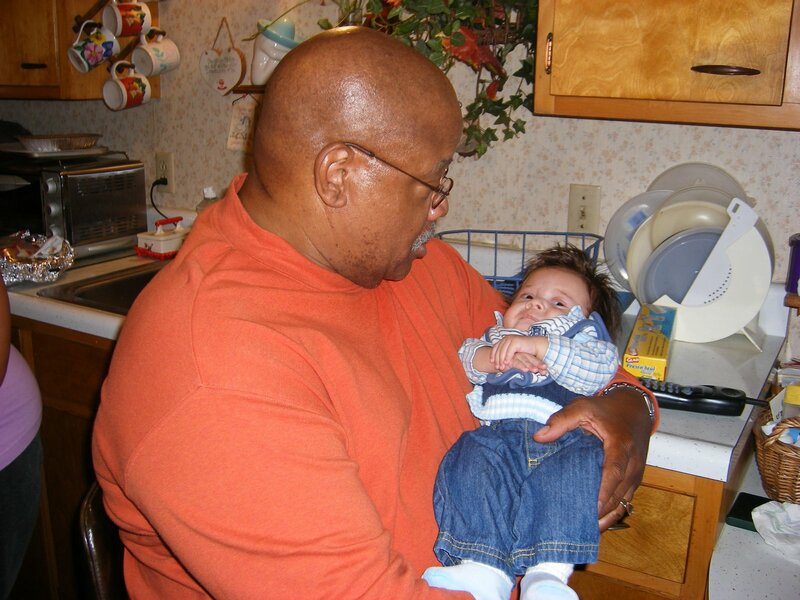 Jimmy holding Logan in 2007. I’m running the race in the name of two people in my family who died of cancer. One was Jimmy Bryant, who had lung cancer. He was a hilarious guy who enjoyed the finer things in life with humility. I know it sounds like an oxymoron, but it was true. Some of his best tales were those about him being a fish out of water as a city boy who would spend time on my grandparents’ farm. The other person is Claire Chisholm Bryant, another cousin of mine, but she was known as “Chubby.” Jimmy’s humor made me giggle and smile with amusement, but Chubby’s made me belly laugh. Growing up she was one of the adults who was easy to talk to and her sense of humor was rooted in commonsense. I will think of them throughout the Shamrock Shuffle’s 8 kilometers. Them as well as a host of other folks whose lives have been touched by cancer. Andre, an amazing coworker whose strength and talent seem endless; my daycare director who is a mother of four and is just like family because of her love for my boys. And there’s a special person in the Twitterverse who I bonded with during my third trimester as we both were having health issues and hoping our little ones baked as long as possible. She’s a spoonie, and my mom is too. She had a healthy baby girl, and then a few weeks later, my Twitterfriend was diagnosed with cancer. I will think of each of these people and other friends as inspiration when I plod along my 8K. And I’ll smile even broader when I hear the footsteps of my best friend right next to me.